The publishers of this card provide descriptions in German, English and French. The German states: "Schloß mit Krautturm, gesprengt 1693". The English version: "Castle with Cabbage Tower, exploded in 1693". 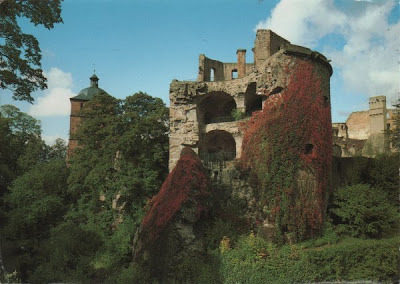 In fact a "Krautturm" has nothing to do with cabbage at all and means a gunpowder tower, and also known as "Pulverturm" the powder (again as in gunpowder) tower, or "Gesprengter Turm" the blown up tower. Checking with Google translate provides the helpful translation, "Castle tower blown up with cabbage, 1693". It does conjure up a lovely image but maybe the original publishers weren't so bad at translation after all. One of these old towers is split down the middle, and one half has tumbled aside. It tumbled in such a way as to establish itself in a picturesque attitude. Then all it lacked was a fitting drapery, and Nature has furnished that; she has robed the rugged mass in flowers and verdure, and made it a charm to the eye. Although the card was sent from the USA, it was bought in Germany. Hilarious! I know there are time when It seemed as if cabbage did have the ability to blow up towers and more. As a child, I lived within throwing distance of the castle. We used to climb up in tha tower. Strictly verboten of course, but so much fun. I think there are barriers now.